Before you proceed with tooth replacement, it’s important to fully understand your options. Here are some common questions about dental implants and some information that can help you decide whether they are right for you. What are the advantages of getting dental implants over other restorations? 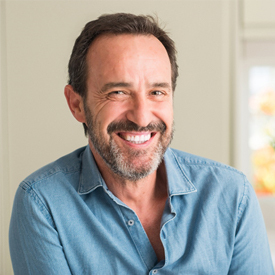 Although dentures and dental bridges have many benefits, the only tooth replacement option that addresses all the negative effects of losing a permanent tooth is dental implants. Here are some of the advantages of dental implants. In the process of stimulating and reinforcing jaw bone growth, dental implants keep the jaw bone strong, helping to support other natural teeth and preventing future tooth loss. In addition, implants do not involve anchoring to healthy, natural teeth like bridges do. As a result, these surrounding natural teeth are more likely to remain healthy with dental implants than with bridges. Although dentures are secured with suction or a metal clasp, they can slip or come loose, often at inconvenient times. With dental implants, you never have to worry this happening. You can bite, chew, speak, laugh, and smile with complete confidence. Out of all the dental restoration options, dental implants have the longest potential lifespan, meaning that you could save time and money in the long run. As with any dental work, the lifespan of your dental implants largely depends on how well you take care of them. If you brush and floss daily and visit our office for checkups and cleanings twice a year, you’re more likely to get more years out of your dental implants. In fact, they can last for 30 years or longer. Compared to dentures, which need to be replaced about every 5 to 7 years, and dental bridges, every 7 to 10 years, dental implants could be your best long-term solution for missing teeth. Many factors contribute to the cost of dental implants, such as how many need to be placed, the type of restoration that will be put on the surface (a crown, bridge, or denture), and whether you need a bone graft. Our compassionate, experienced team will work with you to help you understand your dental and medical insurance coverage so that you can maximize your benefits. We also accept payment from CareCredit, a third-party financing company that make any tooth replacement option you choose fit into your budget. Dental implants may not be the best option for everyone. For example, although smokers can undergo implant placement surgery, the likelihood of failure is much higher for these patients. To avoid implant failure, you may need to have a bone graft to have enough jaw bone density to support the implant. The only way to know for sure whether you’re a good candidate for dental implants is to schedule a consultation to talk to Dr. McKnight. He will be able to review your specific case and discuss your restoration options with you. Contact us to start the conversation about dental implants today!